After commercial whaling ceased on these whales in the 1930s, the right whales have not made any significant recovery. They were called the right whale, possibly by whalers, because it was the “right” whale to kill. They were fairly easy targets, as they are slow swimmers and float when dead. Their exploitation began in 12th Century Spain in the Bay of Biscay and continued for centuries. At one time, they were considered one whale. Recently, it has been demonstrated that there are right whales in the three major ocean basins where they are found: North Pacific, North Atlantic and Southern Ocean. Three species are now recognized: The North Pacific Right Whale (E. japonica), The North Atlantic Right Whale (E. glacialis) and the Southern Right Whale (E. australis). The Japanese hunted them as early as the late 1500s, and the Europeans and Americans joined in 1835, and heavily hunted in the 1800s. Recovery was thwarted by large illegal Soviet catches. Russian whalers illegally killed at least 372 right whales in the eastern North Pacific in the 1960s which may have been the bulk of the remaining population. Even though they were protected, Illegal hunting continued into the 1970s. The North Pacific Right Whale is so rare now that almost every sighting is a news event. It is possible that there are fewer than 100 animals in the entire North Pacific. Most of them appear to be in the northwestern North Atlantic and the Sea of Okhotsk. There have been a few sightings from Hawaiian waters. Recent reports have placed them further south off Japan, the western U.S., and Baja California, Mexico. The North Pacific right whale population is difficult to study and therefore protect because its numbers are so few. In 1998, the International Whaling Commission (IWC) held a Special Meeting of the Scientific Committee to Review the Status of Right Whales. Its threat of extinction is a very real danger. Physical Description: A right whale is a large stocky baleen whale. They are predominantly black but there may be large splotches of white on the underside and other places on the body. Its upper and lower jaws are highly curved which allows its large baleen plates to be enclosed when the animal is swimming. A right whale has no upper (dorsal) fin. Its fins are large and more paddle-shaped than the pointed flippers of most other whales. Its flukes are very wide with a notch in the center. Its eyes are located just above the corners of the mouth. The blowholes are widely separated at the highest point of the rear part of the head and create a bushy V-shaped blow. Its upper jaw is most distinctive as it is often covered by callosities, which are hardened patches of skin that occur in the facial area to which whale lice attach. The largest of the callosities found on top of the rostrum is called the “bonnet.” The upper jaw callosities are generally more continuous than in the southern whales. Young whales have smoother callosity areas that become roughened with age. The callosity patterns are distinctive and are used, together with scarring, to identify individual whales. Length/Weight: Adults are generally 35-55 feet long; females are larger than males. Feeding: Its diet is less varied than most other baleen whales. They feed on planktonic organisms that include krill and copepods. They have a series of 225-250 baleen plates hanging from each side of the upper jaw. The plates are made of a fingernail-like material called keratin that becomes finer on the ends. The maximum length of the plates is 7.2 feet. 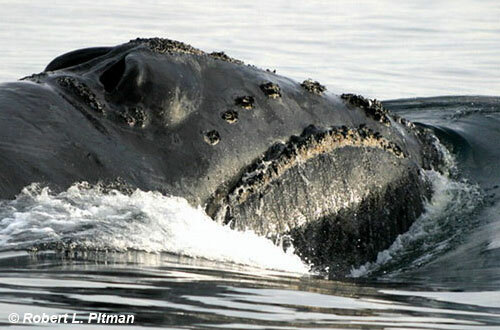 Right whales often swim slowly with their mouths open and food is trapped inside their baleen. Maturity: Males are assumed to reach sexual maturity at 35-40 feet; females at 40-45 feet and as early as five years of age. A calf stays with its mother for a year. These whales are commonly found alone or in small groups of 1-3 animals. Larger groups of up to 30 animals may be found possibly for social or mating behavior. Distribution: Right whales are found worldwide but in very small numbers. Like most baleen whales, they migrate seasonally. Colder waters are for feeding; warmer waters for breeding and calving. They may move out to sea during feeding seasons, but they give birth in coastal areas.